I’ve been using this app for a couple of years now. There’s some up front work to get your recipes into the app, but once that’s done….man does this app pay dividends. I’ve always found the downloader very accurate in ripping recipes from the internet. Maybe some minimal editing required but in general this thing is spot on. Food network receipe? No problem. Pioneer woman’s crazy long detailed recipes? Easy peasy. 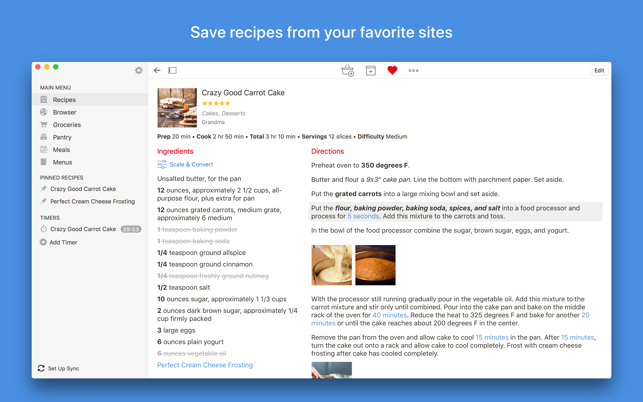 And many other internet recipe sites. Take those old family recipes and stick them in here and never lose them….get rid of the clutter, mix mash recipes on scraps of paper. Print the recipe when you need it - or view it on your iPad if you want (paper is better in my opinion). Grocery list - eh - don’t use it that much but very nice to have. I would also recommend setting up your categories so you can quickly find things when you start getting a lot of receipes in here. Sometimes they can be a little hard to find by name (if you’re like me and can’t remember what the heck you called something). It also helps in planning a meal. If you’re looking for something that goes with a pork or beef dish - you can get a list of options to pick from. It’s extra work up front…but you only do it once. Anyways - I put this up there with the must have productivity apps. My wife and I have used Paprika daily for years -- maybe 5 or 6? I recall being skeptical about the price when we first bought it. I'm here to tell you, however, that it is worth every penny that you spend on it. Knowing what I know now, I would happily pay $100 for the app. We have the MacOS and iOS apps. 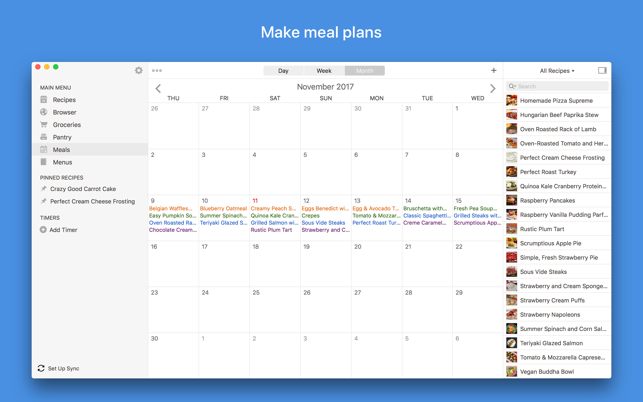 I'll say that the biggest change it enabled for us was to quickly do weekly meal planning and to reduce our trips to the grocery store to once per week. We have saved thousands of dollars in our grocery budget by sticking to the list of groceries that it generates from our meal plan. We schedule regular sessions to sit and enter new recipes, to make sure that we keep it fresh. 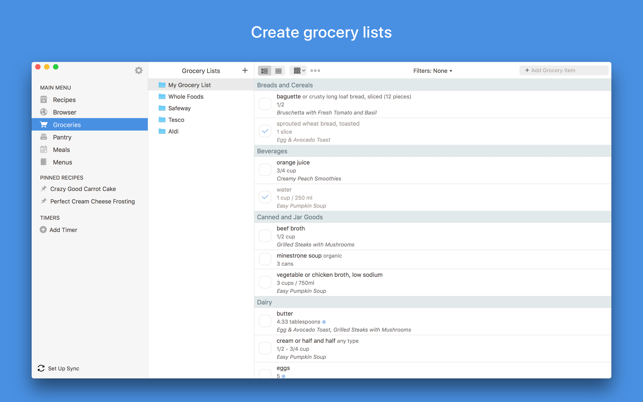 The feature of it syncing in real time means that one of can add forgotten grocery items to the list while the other is at the store and they automagically appear. My only complaint previously was that it didn't remember which aisle I put groceries into. That issues has been addressed with this version. 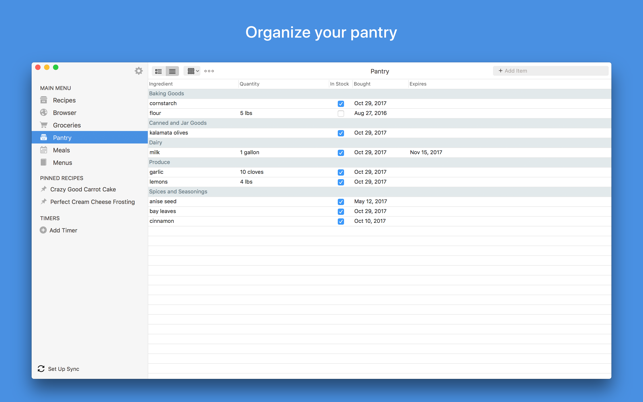 If you are in need of an app that tracks recipes for you and enables you to consolidate, streamline, and improve your grocery shopping and life, look no further than Paprika. It's that good. I too have used MacGourmet Deluxe for a long time (see review by Bunny L.), it has amazing features far beyond those of Paprika, but lately I’ve experienced bugs & serious malfunctions in screen refresh and sync, and such limited tech support to the point that I literally cannot use it, even though I’ve spent DAYS starting over and over from scratch (not a newbie). Out of sheer frustration I bought Paprika for Mac & iOS, and I REALLY like the way it all just works (like things are supposed to on Apple platforms). It is reasonably intuitive so you can learn everything in about an hour. 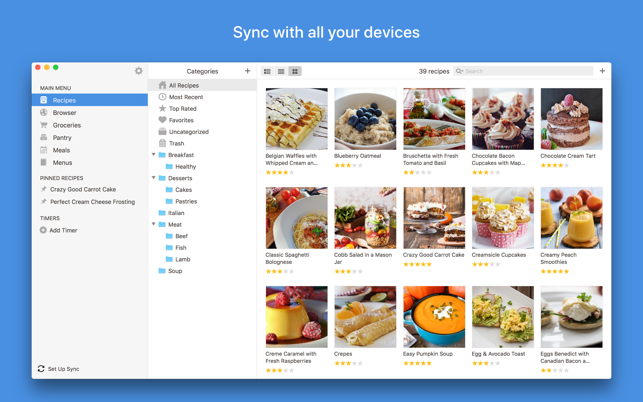 Sync is so easy I don’t even think about it. Although it might work fine for casual users as is, Paprika 3 lacks some of the sophistication of MacGourmet Deluxe; in particular the ability to perform sophisticated (Boolean) searches, which is a feature I find absolutely essential. Hopefully the developers will be adding that capability; I am reluctant to begin investing time in Paprika until it has such stored queries. That said, I think nearly everyone who isn't computer-control freak like me would be very pleased with Paprika.